IPI durable Plastic Engraved Name Tag with bevel edges for a finished professional Look. Price includes a single line of text. Size is 1" in Height and 3" Long. Do you have a idea of a different type or custom cut name tag...email us today [email protected] for a quote. 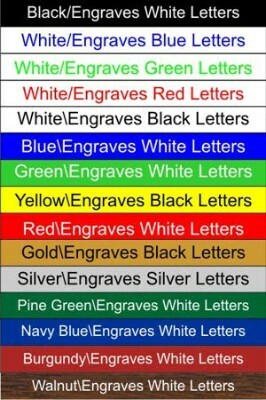 Ariel font is used on all name tags unless you request a different font. Lots of tags you may upload your word, excel or text file below or email your list of names(please reference your order # that is given after you finish you order.